Tired of wrestling with sticky, messy adhesive tape just to create board dividers on your magnetic dry erase board? Ever had that adhesive tape mar your magnetic dry erase board with gluey residue? 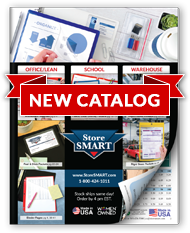 StoreSMART's Magnetic Board Dividers are the answer! Each 1" x 25 foot roll (that's 300 inches) of flexible magnetic tape can be easily trimmed into strips that will fit any magnetic dry erase board. They're simple to reposition, and can be cut with an ordinary pair of scissors. Adhesive tape quickly gets grungy, and dry erase marker lines tend to smear—but our black Magnetic Board Dividers always look fresh and professional. Best of all, they're reusable! Roll contains 25 feet (300 inches) of 1" wide magnetic tape. Businesses: Create innovative Lean or visual management displays. Our Magnetic Board Dividers are also great for creating reusable calendar grids or employee tracking systems. Homeowners: Do you use a central magnetic dry erase board to keep your family organized? Use our Magnetic Board Dividers to create separate areas for keeping lists or tracking activities, or create a reusable calendar grid. Perfect for magnetic white boards!